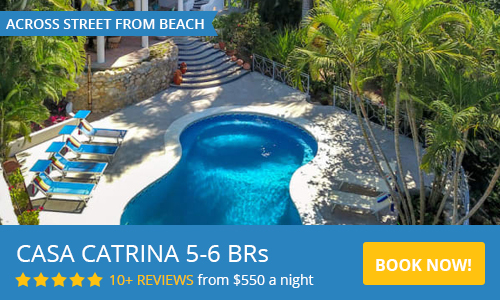 Piedra Blanca in Sayulita is a private, gated estate with multiple homes inside. This one of a kind property is perfect for you and your group with no walking across streets or down roads to visit other homes. 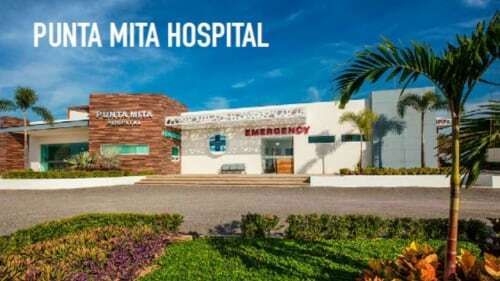 The location of Piedra Blanca is exquisite, beautiful views of the ocean and away from the noise of downtown, yet close, and easy access the beach and town. The Villas in the Piedra Blanca estate have breathtaking views of the surf break, the beach, the Sayulita point, and miles of the azure Pacific Ocean. The villas are only a few blocks (300 meters) to the main Sayulita beach. 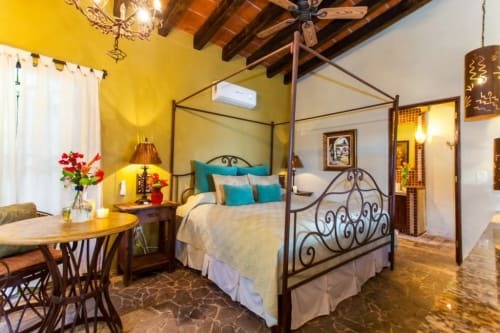 Casa Roca and Casa Piedra Azul will accommodate up to 20 guests (16 adults plus 4 kids) with 7 bedrooms and 7 baths. The villas all share a pool deck. There are three stunning infinity pools and a large outdoor entertainment area. The Piedra Blanca Estate has beautiful landscaping with soft landscape lighting. We look forward to welcoming you to Piedra Blanca Estate, for your Sayulita vacation. Here you can relax, have a drink, surf, read, or whatever your heart desires. Love our estate but have a smaller group? Casa Roca and Casa Azul can be rented together for a total of 6 bedrooms to accommodate 12 guests. Please see our 6 Bedroom listing here. Or we have the option as a 4 BR rental . Please use the contact form to call or email us. We usually respond within 5 minutes! First off, the property is even more beautiful than the photos! The property is beautiful! You have to see it for yourself!!! - Check In was seamless...although not going to lie - we arrived right before sunset, and got stuck outside mesmerized by the VIEWS!! - Yarib was a dream host. Quick to reply, and provided excellent recommendations. - House has everything you need! Even a yoga mat and a grassy area to picnic on. So amazing. - Our groups started humming the Jurassic park themes song every time the gate opened and closed. You'll do it too!! That how gorgeous his place is. - If safety is your concern, worry not! Yarib has security system installed, not to mention you are basically in a castle at the top of a hill completely fenced in by 15 for high walls. You’re good! - the Golf Cart was a real treat! Made it easy to zoom in and out of town...but don’t forget to “cool the wires down after the initial hill” haha (I know that doesn’t make sense to you now...but you’ll get it once you stay here) - I should also mention the house keepers were so nice....did not expect to get the house changed over (cleaned) twice during our stay. That was a real treat! Especially for my large group of 15. - if you’ve read up to this part, you have to be hooked. Book it! Literally the most beautiful place I've every stayed. It was so clean, sparkling, great views, quiet, and Martin the host was so nice, chill and helpful! Super dynamic property that was fun for a big group but also allowed people to separate into the different areas and have some personal space. Amazing views, close to town and having access to another vehicle made getting to and from town super easy. We had a wonderful time and highly recommend this property. Gracias! The Villas Piedra Blanca Estate was perfect! We knew when we first walked in the door that we made the right choice for our first visit. Opening the doors to the huge terrace brings the beauty of Sayulita bay into your living room. We had many meals on the terrace, spotted whales, and watched beautiful sunsets. The grill was great to have. We grilled fresh fish that we bought at the fishing boats (about 5 minutes away), a great place that was recommended by the manager Martin who gave us lots of other helpful information. We had a nice breakfast at El Espresso in the plaza We also rented our snorkel gear at the Shops from the Dive Shop. 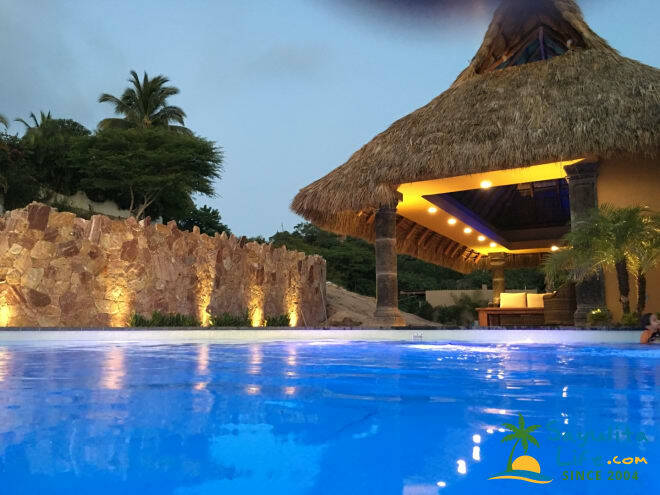 The location and view from the Villas are wonderful and the furnishings are combination Mexican and beach and were all absolutely first class. The linens, towels, pillows EVERYTHING was off the chart. ... they really thought this place through because for us, everything is in the details. Kitchen inside Casa Azul is about as good as it gets in any Million dollar home. I highly recommend staying here if you are in Sayulita. The staff at the Villas is very helpful and all of our interactions with the property manager were great. This was a dream vacation for our family! Me and my husband came to Sayulita for our romantic get away and my expectations of a romantic get away were surpassed. The view of the pueblo from the house is breath taking. The home is well taken care of and the location of it is ideal if you have a family or a romantic partner. Insane view of Sayulita surf break! Our villa was exactly what we expected from staying in this gorgeous home before. Managers were very helpful and went out of their way for assistance. Enjoyed the gorgeous view and infinity pool the most. Full Gourmet Professional kitchen made it nice to cook and eat in as a family. You won't believe the view from the pool deck and the sunsets. The house is perched exactly on the best spot to see the entire beach cove. See you next year and thanks for the ride! Our group of ladies rented both homes on the estate and the upper level pool and palapa to celebrate 14 women turning 50 yrs. old. The homes sit up very high, the drive up is a little tricky but the golf carts made it just fine. Big advantage of the house sitting way up high is it's views and privacy. The house is not on the beach but you can see miles of it. The kitchens were well stocked with utensils, pots etc. The house host always answered his phone and was very attentive with anything we asked or requested. Would definitely stay here again. Only downfall is the rooms did not have heavy curtains/blinds so the sun would come in strong and heat up the rooms. We mentioned this to the owner and she will be adding blinds to the home to fix this problem. The showers are all very roomy with great shower heads. The houses are nicely decorated and furnished. We hired 2 wonderful ladies to cook for us. I highly recommend them. Best location and best time in a long time! This estate is well thought out is the first thing that comes to mind from the very beginning of our family trip. The shuttle service from sayulita sayulita was great door-to-door service and they couldn't have been nicer. We were absolutely speechless once we unloaded and soaked in the view. The houses were immaculate brand-new I should live so well at home. The best part about this place is the privacy on the north side as we spent the better part of the vacation on the property. This place does not feel like a rental at all and we were blown away by the linens, beds and furniture, kitchen stuff etc. all felt and had to be expensive and we definitely felt the difference. Can't say enough about Martin who is extremely helpful and the golf cart was super fun for my kids. The town Center is two blocks down the hill and three blocks to the left so less than five minutes. We've already booked for next year thanks again!! Our entire stay was perfect, we couldn't have asked for anything better. Awesome location up on the hill (a long walk to town, but we had two golf carts) was quiet and offered perfect views of the town and bay. Martin was prompt to respond to any needs we had, and check in/check out process was super easy. I had my wedding at the villa and it was one of most amazing experiences of my life. The place itself is modern and beautiful, the view was incredible, and it was the perfect place for our 14 family members to stay at for a week. The villa had everything we needed. The outdoor wedding reception itself was magical with the sunset view as the perfect backdrop. Our house manager Martin was an absolute pleasure to work with, and we highly recommend the villa for a big group. We hope to come back to Sayulita and stay here again! -50% down to block the dates on the calendar and the remind 50% is due 45 days prior to the arrival.-The prices apply for a payment with a direct wire transfer.-You can pay with PAYPAL as well and we will add the commission fee.-We have a final clean up fee and golf cart service fee per stay. Your rental includes the use of a custom Golf Cart! The minimun stay depending the dates, please contact us for more info. We are native Californians that have been in Sayulita and a community member for over 15 years. We personally deal with all of our homes here and are very hands on as we have dedicated our lives to having the best rentals in Sayulita.